Here we take a look at some of the most famous Croats in the fields of science and the arts. For information about famous Croatian sportsmen and women – including the exploits of the Croatian Football Team – see our Croatian Sports Teams and People page. Mestrovic is one of Croatia’s best-known sculptors. Born in 1883 in a village in present-day Slavonia, he moved to Split to work as an apprentice in a stone cutter’s workshop before going to study at the Academy of Fine Arts in Vienna at the age of 18. Moving on to Paris, his work started to attract attention from others in the art world at the time. Having moved back to Croatia in the 1920s, he was imprisoned for three months during World War II by the then fascist government, although was released following the intervention of the Vatican. Escaping to Western Europe, Mestrovic moved to the United States after World War II to teach at Syrcacuse University. After gaining American citizenship in 1954, Mestrovic stayed in the U.S. for the remainder of his life, and died there in 1962. 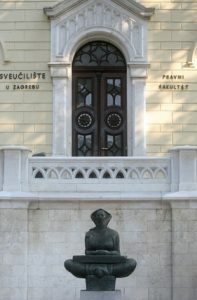 Mestrovic’s most famous works include the statue of Gregory of Nin in Split (see also Sightseeing in Split); a statue of the Croatian bishop and politician Josip Juraj Strossmayer in Zagreb; statues of inventor Nikola Tesla in Zagreb, Belgrade and at Niagara Falls; and the History of the Croats statue, a copy of which stands in front of Zagreb University (shown on the left). There is also a Mestrovic Gallery in Split, which contains a number of his works. Inventor and electrical engineer Tesla’s work in the late 19th and early 20th centuries did much for the technological development of electricity and wireless devices and communication (i.e. radio) amongst many other (sometimes overlooked) achievements. He was born near the town of Gospic in present-day Croatia, although his ethnicity was Serbian (and he later moved to the U.S. and took American citizenship). He is celebrated with monuments, statues and museums in both Croatia and Serbia (the airport in Belgrade is named Nikola Tesla Airport), as well as in the United States. The unit tesla, used to measure magnetic fields, is named after the inventor. His name has also been used by Tesla Motors – an American company that manufactures electric cars – and even the 80s hard rock band Tesla(!). An 18th century astronomer, physicist, philosopher and mathematician from Ragusa (present day Dubrovnik), Boskovic’s works and studies are most prevalent in the field of astronomy. His name is used for the Ruder Boskovic Institute, a science research centre, in Zagreb. Ivo Pogorelic, born in 1958, is a famous concert pianist who has perfomed around the world with many profilic orchestras. Krist Novoselic of Nirvana and Tomislav (Tomo) Milicevic of 30 Seconds To Mars are both of Croatian parentage. Cello duo 2Cellos have risen sharply to international fame in the last few years, with some fantastic covers of famous modern songs (Smooth Criminal, Smells Like Teen Spirit, Sweet Child o’ Mine). They have accompanied Elton John on tour and have even made an appearance in an episode of Glee – take a look at the video below! Andric (1892 – 1975) was born in Bosnia to a Bosnian Croat family. He was a civil servant and diplomat as well as an author, holding various high-profile posts including Ambassador to Germany. His most famous work is The Bridge on the Drina, which was published in 1945. Born in Rijeka in 1959, Slavenka Drakulic is a journalist and writer who has written a number of fiction and non-fiction books about her home region and the recent war, including As If I Am Not There, Balkan Express, Cafe Europa, and They Would Never Hurt A Fly. She now resides in Sweden. A 17th century poet from Dubrovnik, his most famous works includes the poems Osman and Tears of the Prodigal Son. Visnjic himself was actually born in Sibenik; he first came to prominence when he starred in Hamlet at the Dubrovnik Film Festival from 1994 to 2000. He has also been in a number of films, such as Practical Magic, Welcome to Sarajevo, and Elektra. His most recent work includes parts in The Girl With The Dragon Tattoo and The Counsellor, in several episodes of TV show Pan Am (playing a Yugoslav diplomat), and as a regular in the TV series Extant and Timeless. A well-known actor in Yugoslavia in the 1970s and 1980s, Serbedzija began his career whilst studying at the Academy of Dramatic Arts at the University of Zagreb. He started appearing in Hollywood films in the late 1990s, and has built up quite a career – in fact, he’s one of those actors who keeps popping up in all sorts of movies unexpectedly, normally playing some kind of shady character or “foreign” (normally Eastern European!) villian. His film and TV credits include Mission Impossible II, Batman Begins, CSI: Miami, 24 and Harry Potter and the Deathly Hallows. He also appears in Angelina Jolie’s directorial debut In The Land Of Blood And Honey. Serbedzija is co-founder of the Ulysses Theatre on Veliki Brijun island, which runs a special season each summer. A film producer, Lustig is a double-Academy Award winner, with Oscars for Best Picture for Schindler’s List in 1994 and Gladiator in 2001. The Grgich Hills Estate winery in Napa Valley, California was established by Mike (Miljenko) Grgich who was born in Dalmatia and learnt much of his craft from his father, who had a vineyard there. He fled then-Yugoslavia in the 1950s and settled in California in 1958. Nick Nobilo, who founded New Zealand wine company Nobilo Wines, was born on the island of Korcula. Anthony (Ante) Maglica, born in 1930, is the inventor of the Maglite torches and flashlights. Although he was born in New York, his family returned to the island of Zlarin (a small island near Sibenik) which is where he grew up. He returned to the U.S. in 1950 and set up his business (Mag Instrument Inc) in 1975. Split-born George Mateljan, who now resides in the U.S., is a renowned food expert and author of a number of popular cookery books, including The World’s Heathiest Foods. Read up on his advice on the fascinating website The World’s Healthiest Foods. Famous Venetian explorer Marco Polo (1254 – 1324) was thought to have been born on the island of Korcula (although there is little concrete proof to support this – or to show where he was actually born), which was part of the Venetian Empire at that time. Nevertheless, he is celebrated on the island and you can see his supposed house of birth there. The Tadich Grill restaurant in San Francisco is thought to be the oldest restaurant in California, having opened in 1849. However, it was in 1887 that the restaurant was purchased by John Tadich, who was from Stari Grad on the island of Hvar, and who gave it its name. It is still a fabulous seafood restaurant to this day – if you are ever in the city, make sure you pay it a visit!